A US Army Interrogation unit report on the interrogation of Hanna Reitsch. Reitsch was a famous female German test pilot. She was the only woman to win the German Iron Cross. She is believed to be the last person to leave Hitler's air raid shelter alive. The report gives her firsthand account of the last days in Hitler's bunker. 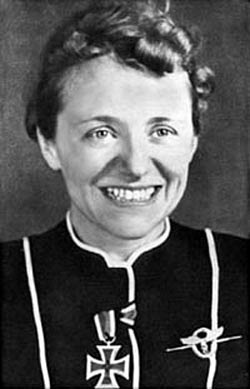 "This report is the story of the last days of the war as they were experienced by Hanna Reitsch the well known German test pilot and aeronautical research expert. Her story does not pretend to add any sensational details to what is already known of those days. It is rather an eye-witness account of what actually happened in the highest places during the last moments of the War. Her account of the flight into Berlin to report to Hitler and of her stay in the Fuehrer's bunker is probably as accurate a one as will be obtained of those last days, although the "is he dead or is he not dead" fate of Hitler is only answered to the extent of describing the mental state and the hopelessness of the last-minute situation, from which individual opinions must be drawn. Her own opinion is that the tactical situation and Hitler's own physical condition made any thoughts of his escape inconceivable." Also in this set are the reports "Last Letters from Hitler's Air Raid Shelter" and "Condemnation of Goering by Hanna Reitsch." The "Last Letters from Hitler's Air Raid Shelter" report deals with the fact that Reitsch was given letters to deliver by various occupants of Hitler's bunker during the last days. Included among them were letters written by Eva Braun and Himler. Reitsch had close contact with the leadership of the Luftwaffe. In the third report she paints an unflattering portrait of Commander-in-Chief of the Luftwaffe, Hermann Göring to her U.S. Army interrogators.